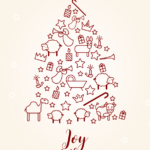 Christmas Services – Joy to the World! Shiny foil leaflets inviting you and your family and friends to our Christmas services will be available in the Church this coming week. Please take some and pass them on, inviting others to join us in celebrating the gift of Jesus.